What are your boots made for? Nancy Sinatra would tell you they’re made for walkin’, but our boots are made for riding and that’s a whole different ballgame. 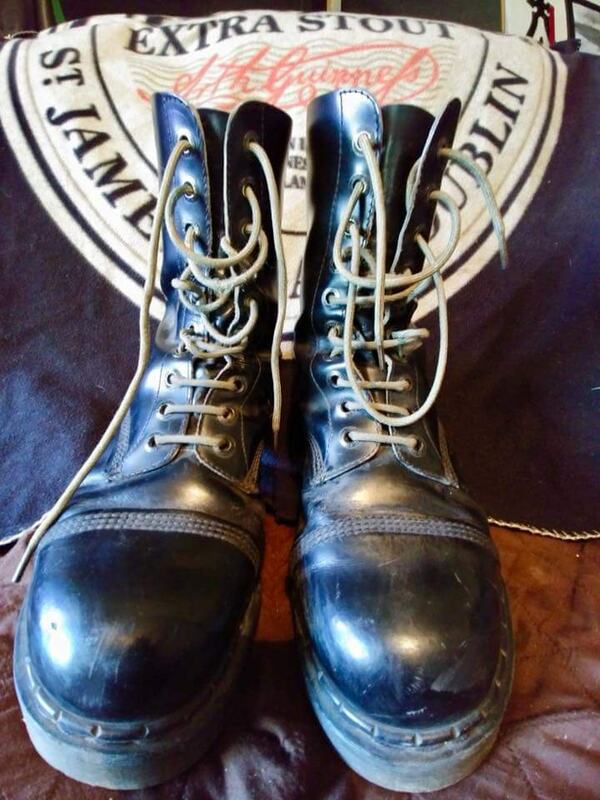 For Show Me Your Boots! – Gear Talk Episode One, Total Motorcycle asked our community of riders to show us their boots in their natural habitats. We also asked them to vote on which single characteristic they considered the highest priority when selecting their footwear. 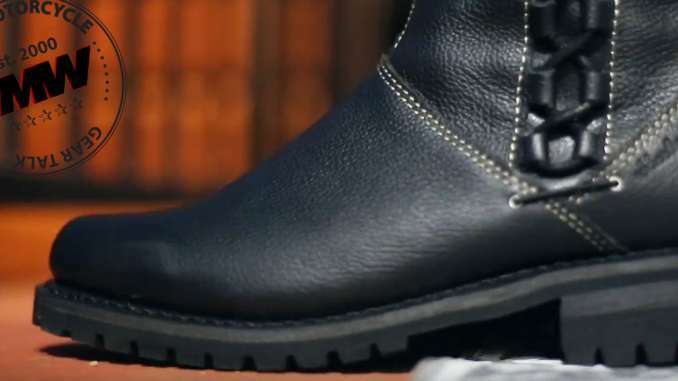 Literally the ability of the boot to protect your tender soles. Not just from a down, but from the heat of the asphalt, the elements, the stress of supporting your bike at a stoplight. How well your boots reflect your philosophy. Classic, outlaw, old school, techno, fringe, futuristic. Do they stand out hooked over a bar stool, or do they look like everyone elses? And if they do, is that the whole point? Whether because you trust the name or your ensemble has to match, loyalty to a brand is a thing. Sheer economics. The best boot you can that will last the longest at at the lowest price. Most of us still have stuff to do after the kickstand is down. Can you go about the rest of your day in the boots you wore for the ride? Or is a better question, can you ride in the shoes you’ll need for the rest of your day? Surprisingly, Brand won the vote over every other category. The consensus of the group was that the top three brands riders like to wear are Alpinestars, Harley Davidson, Milwaukee Motors and Sidi. Riders gave some clever explanations that suggested picking a good brand name covers all the categories of the poll. By choosing a trusted brand name, riders count on safety, durability, an accurate fit, style and comfort over vanity of a label. Premium brands demand premium prices. It was mentioned more than once that when selecting such an important piece of gear, cost doesn’t matter. This came to mind last weekend when my husband and I were riding down the main street of a college town. We spotted a young rider on a bike with dealer plates, shiny new helmet and jacket and, you guessed it, gym shoes. After signing the loan paperwork the boy spent his savings on a top dollar helmet and riding jacket. Looks like he’ll wait until next payday to add a good pair of boots to his ensemble. Meanwhile, it is common to see folks sporting riding boots who have never had the pleasure of being atop a shiny steed, but wear them for the flashy name brand, fit or durability of the leather and sole. We know a waitress at a diner we frequent that swears she couldn’t work on her feet all day without her HD boots. We’ve all been there in our heads at some point, in a hurry, things on our minds like, “I’m just going to run up the street a couple blocks to check the adjustment of my new clutch lever,” or, “I’m just headed to the gas station in my neighborhood and traffic isn’t bad this evening.” It’s just not worth the risk. Don your boots, every time. I keep a pair of cheap lightweight sandals in my saddlebags, and a pair of slip on shoes to change into in my office. My riding boots have their own spot in a corner under the desk. 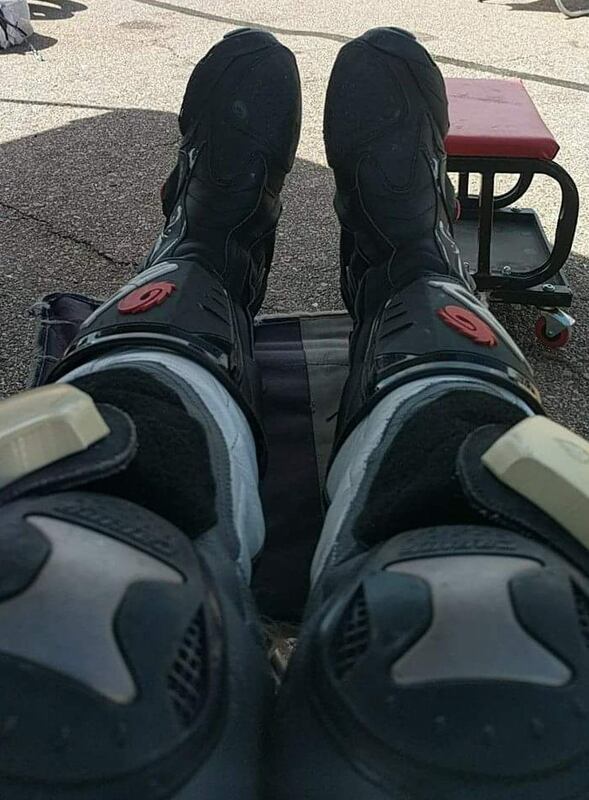 My stiletto boots go in mine or my husband’s back pack while we ride to bike night, and I switch them out in the parking lot. Finally, many veterans responded that when riding, they wear their government issued combat boots with the opinion that if they are good enough to protect them during warfare, they’re surely good enough for the open road. 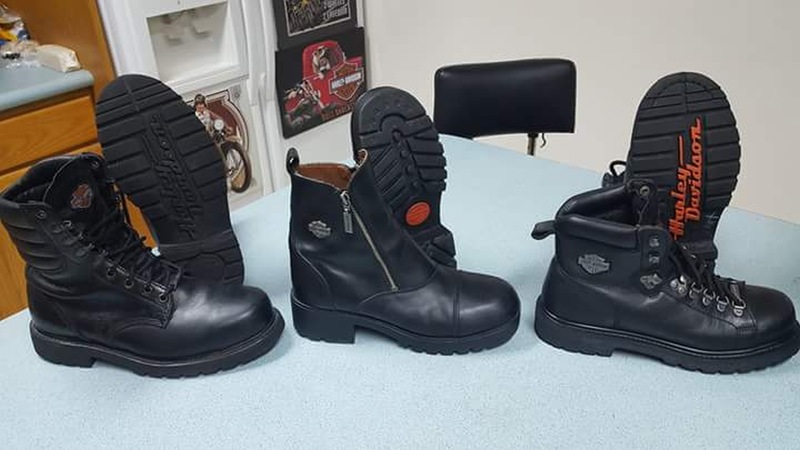 Thanks to the hundreds of different styles offered by boot manufacturers, riders can make our kicks fit our own personal style. Whether you like cruising distances, attending local charity rides or bike nights, an occasional spin up the canyon with a group of friends, participating in race track events or dual sport adventuring, everybody has a look/function they’re shooting for. On the way home from a local motorcycle shop grand opening event, my teenage daughter commented she noticed that all lady riders have wicked style, lots of bling, colorful hair and heavy mascara. She said biker guys must really like having beards and biker girls are pure badassery. I thanked her for the compliment, a big smile on my proud mama face. 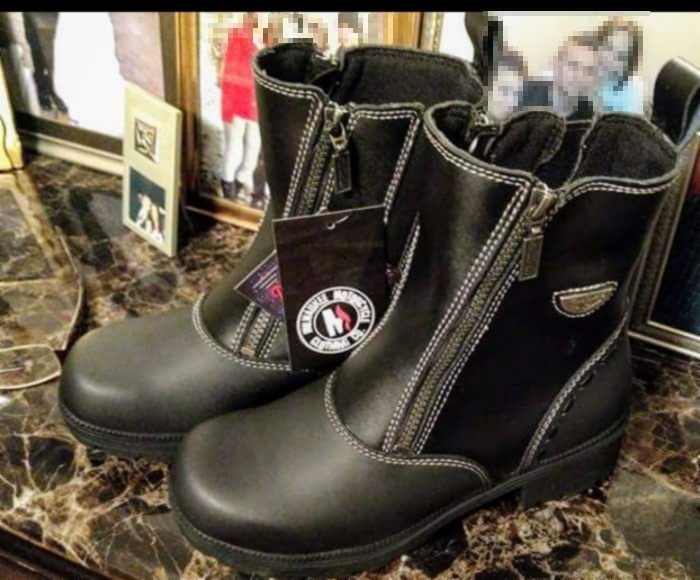 It was the lady riders that inspired me to do an article on boots to begin with, and I was particularly eager to see the responses from my rider sisters. Lady riders are just shaped differently, that’s just a fact. I’m not talking about our glamorous curves, but the fact that we’re shorter on average bikes are generally designed for. Thus, some require an additional amount of heel to confidently keep their bikes upright at stop lights. 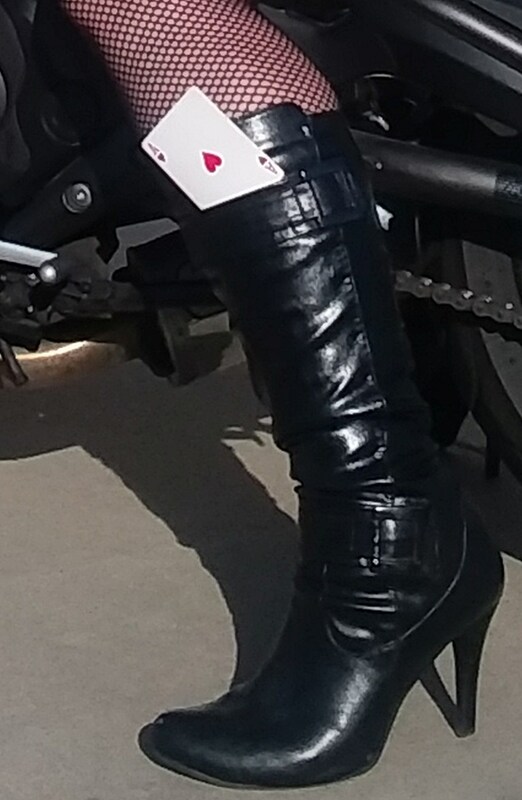 As I started receiving pictures of riders’ boots I noticed a trend of high cuffed, lace up leather boots. At first sight my intention was to order a pair for myself because they were cute, and I commented as much. 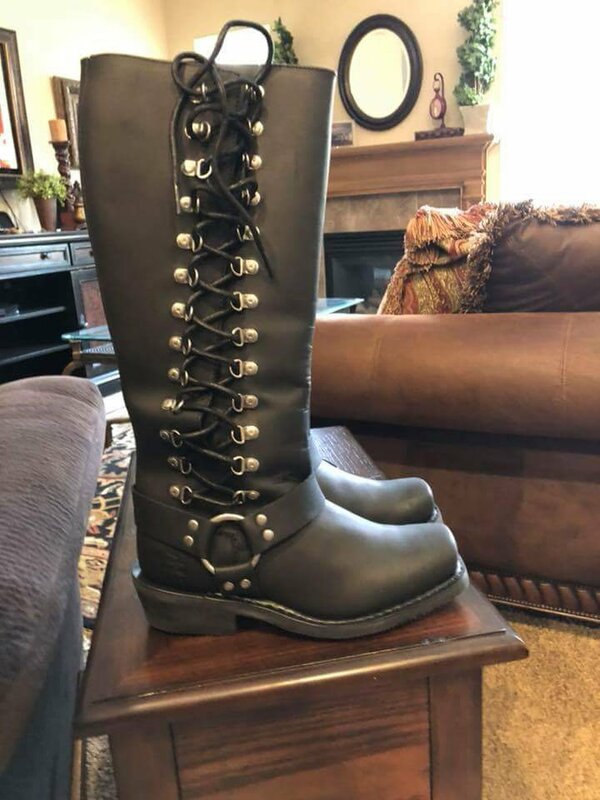 I received multiple comments that they were purchased not so much because they were attractive, but because the laces can accommodate a large range of adjustability, fitting any size of leg or calf circumference. 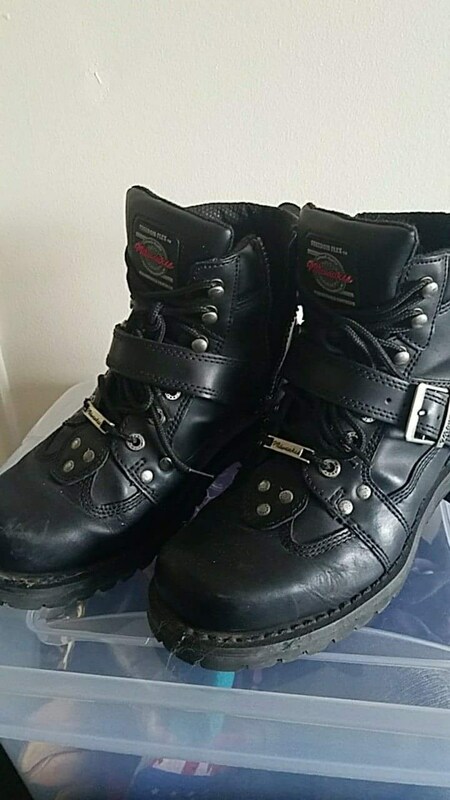 One gentleman commented that in lieu of boots manufactured specifically for motorcycle riders, he wears the same Doc Martins (top dollar, thick soled street boots that were popular during his high school days). 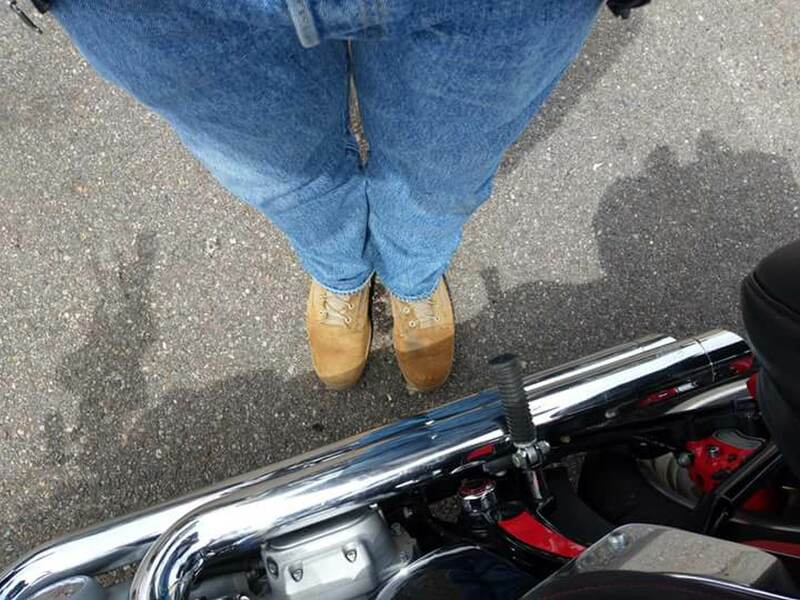 I own a pair of Docs myself, and I asked him if he’s ever got the toe stuck between the shift lever and the foot peg. His prompt, practiced response was that shift lever positions are fairly easy to adjust. I was left with the feeling that I wasn’t the first to query. One gal told me she and her hubby both wear the leather type with the metal ring on the outer edge and leather straps because they was the style her dad wore when she was growing up. This is a sentimental decision, suggesting a lifelong ideal of how a biker is supposed to dress. She did mention they were aware of multiple instances where a rider will go down and get the metal ring stuck on his foot peg and get dragged, similar to a cowboy boot hung up in a horse saddle stirrup. That thought had never occurred to me. It pleased me to learn that my assumptions about the responses I would receive from the Comfort category were incorrect . Not one person told me they just wear any old footwear when they ride. Flip flops and shorts, dress clothes with sandals, or loafers and sneakers. My husband Eric and I have taught our children how to accurately spot a ‘squid’ in the wild, meaning you can see a rider’s bare ankles and knees while en route to their destination. All in good fun of course, but we hope to inspire smart choices in their riding gear someday when they become motorcycle enthusiasts just like dad and me. Some riders dress for their day rather than for the ride. The guy that likes to take his enduro to the creek to do a bit of fishing prefers sturdy hiking boots for walking the trail. Not ideal of course, but preferred over the guy that rides in his loafers to match his tie and slacks. 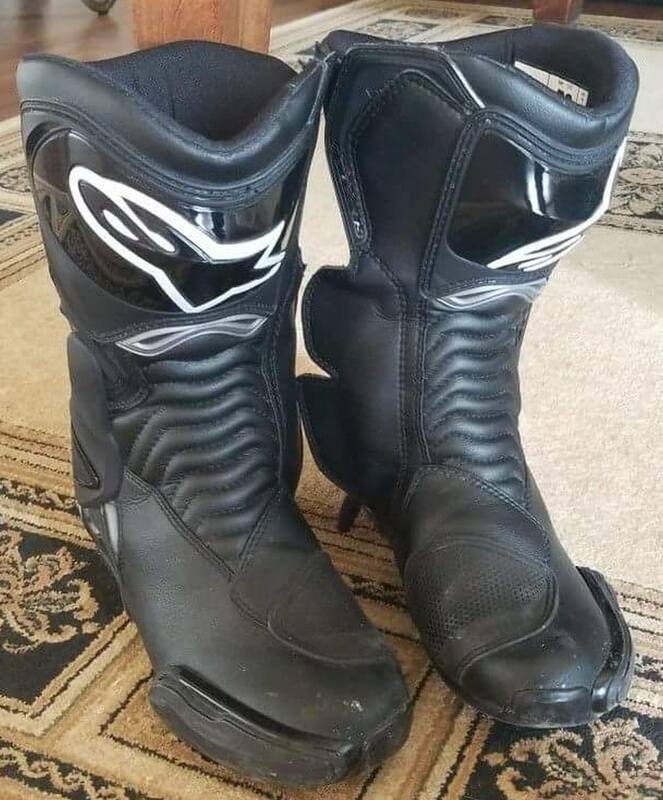 A couple years ago a friend of ours bought a pair of tennis shoe style boots designed for sport bike riders for both comfort and safety. 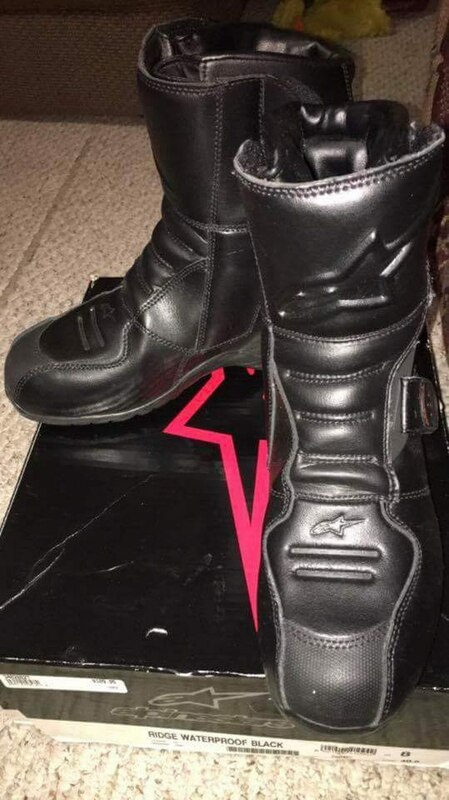 Noticing him astride his beast of a sport bike one day, wearing his cruiser leather boots, I asked him why he didn’t ride in the sport shoes anymore. He told me that they were so comfortable he just starting wearing them like everyday footwear, even during the off season. He wore them out and hasn’t acquired a new pair yet. We’ve all been there, riding in the best boots we can afford until we wear them out. Some of us are hoping to have the budget when the time comes to upgrade. Others are changing riding styles and waiting to buy gear after they settle on one. Many will buy an exact replica of what they are wearing right now. The value category means acquiring sturdy boots that will accommodate your needs for many miles of adventure, rather than settling for the cheapest boot available online in your colors that qualify for free two day shipping. As mentioned above, sometimes riders will wear what they already have. The cheapest pair of boots is the pair you already own. Thank you for taking the time to read Episode One of Gear Talk. We look forward to sharing more episodes featuring opinions about riding gear from riders just like you. I can say this, the opinions I received really gave me a perspective for the individual needs of riders and highlighted areas of importance that I have never considered before when selecting my own motorcycle gear. Here’s just a couple more images that voters generously shared with us. I gotta tell you I love all the shift lever patina. If these boots could talk, oh the stories they would tell.